Nag Panchami is observed on Friday 1st August in 2014. Nag Panchami is also called as Naga Chaturdi, Naga Chaturthi and Naga Panchami. In some parts of Andhra Pradesh and Telangana it is celebrated in the month of Sravana maas. The festival falls on the auspicious day of Shravana Shukla Panchami that is the fifth day fortnight of Shravana Masam (July/August). 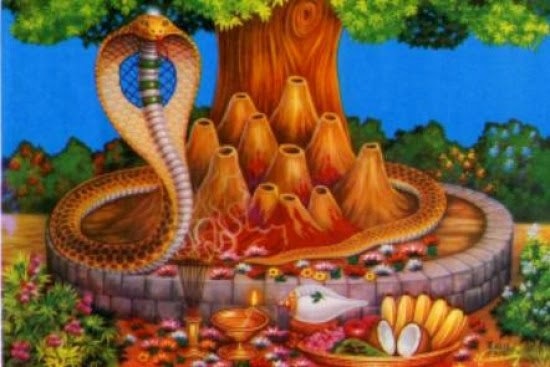 Naga means Snake and the festival is called as Naga Panchami as this festival is all about worship of Snakes on the fifth day of Shravana Masam. Nag Panchami is observed on Shravana Masam. Nagula Chavithi is observed on Monday 27th October in 2014. Nagula Chavithi is an auspicious day to observe Naga Puja. 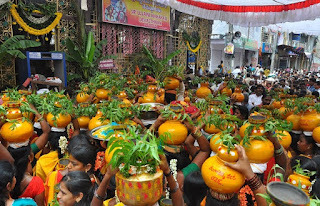 Nagula Chavithi in kartika maas is a major festival in Andhra Pradesh and some parts of Karnataka. Nagula Chavithi is observed on the fourth day after Deepavali/Diwali Amavasya. Nagula Chavithi is observed on Karthika Masam. Naga Panchami and Nagula Chavithi is mostly celebrated by Hindus. Nag Panchami is observing pooja to Naga Devatha hence, mainly it is the women's festival. on the auspicious day of the Nag Panchami festival, women wake up early do abhyanga snana. They will make corn from Jonnalu (Jowar, sorghum, cholam). A Sweet is prepared Generally sira with (Prepared with Bombay Rava and milk, Kaju, Sugar) and some People will also offer Rice as naivedyam. women keep fast and observe Naga Puja. Devotees offer milk, eggs, jonnalu, naivedya, Flowers, dry fruits, pasupu (Turmeric), Kumkum (Vermilon), Akinthalu (Prepared with the combining of Rice, Turmeric, Kumkum And Ghee) and kankanam (Prepared with thread, turmeric and Flower) to Naga Devata at the Putta (snake pits). After pooja people will Pradakshina's Five or nine or eleven as the people wish. After that people will give the Jonnalu and sira with the surrounding people. women's will pour milk into hole, then turmeric kumkum after collect some Pit mud and mix it in some milk and after coming to home they will wash the eyes with the milk and tie the kankanam to the hand. After this process women's will broke the fast and take the naivedya as food. As a popular legend associated with Nag Panchami is Lord Shiva drank the Halahala (poison) to save the universe during the famous incident of samudra manthan between the gods and demons. On the Nag Panchami day Lord Shiva also worshiped. Naga Panchami is festival of worshiping snakes. Naga Panchami is celebrated in Lord Shiva temples also. Snakes are believed to Gods since puranas. As we know lord Shiva neck is covered with a snake, Lord Vishnu sleeps (shesha talapam) on snake.